These are data loggers from Pico Technology, which are connected to the USB interface of a PC during the operation and are also fed via this. The data loggers have no battery or internal memory, but use the computer's hard-disk space to record the data with date and time stamps. During and after the recording, the measured data can be displayed as measuring curves and tables on the PC monitor as well as zoomed, printed and exported. 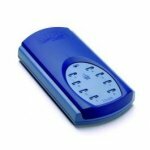 The convenient data logger software is provided free of charge with the data loggers.